High lunge. When there are kinks in the body’s kinetic chain, joints fail to operate at full function. This is seen when tight hip flexors contribute to underactive glutes and, as a result, potential lower-back or knee problems. ➢ Step back with the right foot, and lower the body into a lunge. 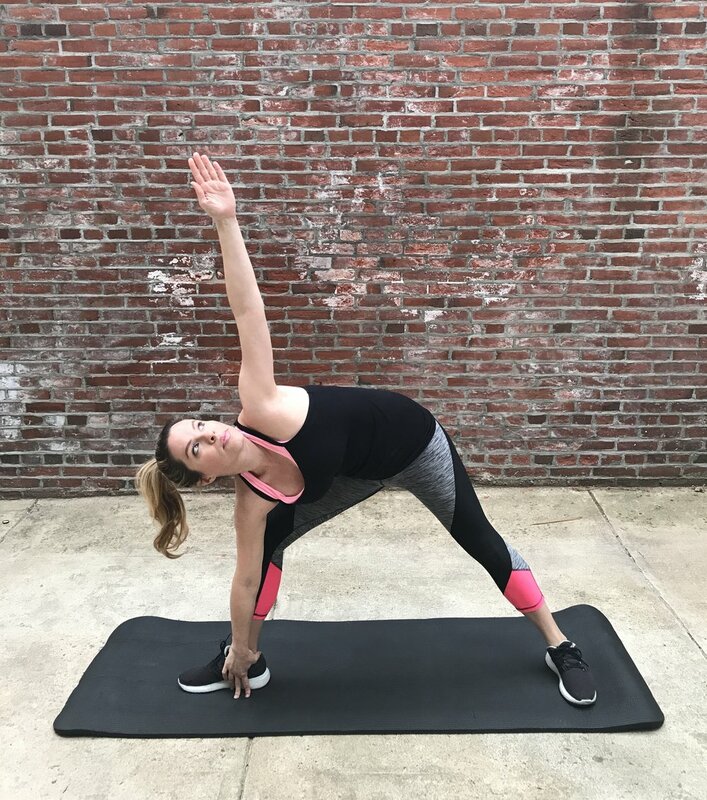 ➢ Fold forward and place the hands on either side of the left foot, making sure the right leg forms a straight line from the hip to the foot. ➢ Lift your chest up and stand tall, bringing the arms into an extended overhead position. Hold for 20 to 30 seconds, then repeat on the opposite side. Extended side angle. This total body stretch opens the hips, lengthens the hamstrings, and strengthens the core and leg muscles. ➢ Stand with the feet shoulder-width apart. ➢ Elevate both arms until they are positioned parallel to the floor. ➢ Step the right leg out and turn the right foot and thigh out to the side. The foot and shin should form a 90-degree angle. ➢ Bend at the right knee and torso until the fingertips of your right hand graze the ground. Hold for 20 to 30 seconds, then repeat this stretch on the opposite side. Wide-legged child’s pose. This gentle stretch opens the legs into a deeper position, which helps improve your overall hip health. ➢ Begin on the hands and knees, positioning the knees wider than shoulder width apart. The feet are in plantar flexion, with the top of the foot touching the mat. ➢ Take a deep breath, straighten the spine and slowly lower the body so that your torso falls between your knees and your forehead is resting against the mat. ➢ Extend your arms and hold for 20 to 30 seconds.